Prunella Scales was born Prunella Margaret Rumney Illingsworth in 1932 in Sutton Abingers, Surrey. Her mother, was an actress, Catherien Scales, and Prunella took her last name when she too became an actress. She was educated at a prestigious boarding school for girls in Eastbourne. She left at seventeen to study firstly at the Old Vic Theatre School. and later in New York at the Herbert Berghof Studios. She developed an ability to do a wide range of characters by appearing in a wide range of plays in repertory theatre. Prunella’s early TV parts included appearances as waitresses and barmaids, but in 1963, she played bus conductress Eileen Hughes in the long-running soap Coronation Street. That same year, she teamed up with Richard Briers for a husband & wife sitcom called Marriage Lines. The show was written for Briers, but made a star of Prunella. 44 episodes were made for TV and another 26 adapted into a radio series. She has also done a small amount of film work. Hobsons Choice (1954) was an early success with co-stars Charles Laughton and John Mills. She later appeared with Gregory Peck and Sir Laurence Olivier in the film The Boys from Brazil (1978), and also the Sherlock Holmes classic The Hound of the Baskervilles (1978) with Dudley Moore, Peter Cook & Penelope Keith. 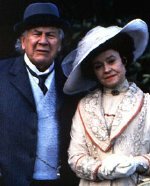 She also starred in the film Stiff Upper Lips (1998), with Peter Ustinov and her son Samuel West. Teresa Ransom has written her authorised biography, Prunella, published in 2005. Two years later, Prunella began her longest-lasting sitcom role in After Henry (1988-1992). She played Sarah France, a middle-aged woman who has to cope with life after becoming a widow. Sharing a house with her mother (another part for Joan Sanderson) and teenage daughter, just adds to her problems! 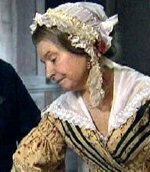 Prunella’s other TV roles include the period drama Emma (1997) for which she insisted that her teeth be coloured yellow to suit her character of Mrs. Bates, and episodes of Midsomer Murders (2000), Silent Witness (2001) and Casualty (2004). She has often returned to theatre work throughout her life. over and over again, "I know...I know..."? In fact, Prunella is nothing like Sybil in real life! abeth Mapp alongside Geraldine McEwan asLucia Lucas. Although polite to each other on the surface, Mapp and Lucia are bitter rivals who engage in all sorts of devious plots against each other! Elizabeth II that when Prunella was awarded a CBE (Commander of the British Empire) Her Majesty said, "I suppose you think you ought to be doing this." in one of the longest-running and most successful British TV advertising campaigns. The final advertisement was shown in 2004. By promoting the slogan 'Every Little Helps', Prunella helped Tesco achieve record profits of over £2 billion! 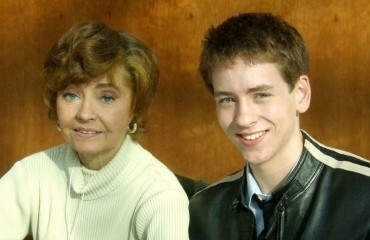 I met actress Prunella Scales at Autographica in October 2007. She has played many roles but is probably best remembered for Fawlty Towers and the Tesco commercials. 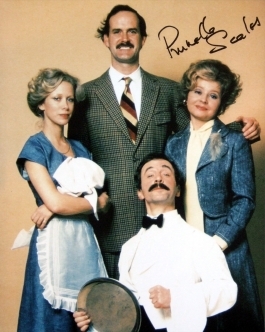 She signed a photo of the Fawlty Towers cast for me. West, and they have two sons. The eldest, Samuel West, is also an actor.